The reading of the card persuaded me that he was dead and I was disturbed to find myself at check. Had he not been dead I would have gone into the little dark room behind the shop to find him sitting in his arm-­chair by the fire, nearly smothered in his great-­coat. Perhaps my aunt would have given me a packet of High Toast for him and this present would have roused him from his stupefied doze. It was always I who emptied the packet into his black snuff-­box for his hands trembled too much to allow him to do this without spilling half the snuff about the floor. Even as he raised his large trembling hand to his nose little clouds of smoke dribbled through his fingers over the front of his coat. It may have been these constant showers of snuff which gave his ancient priestly garments their green faded look for the red handkerchief, blackened, as it always was, with the snuff-­stains of a week, with which he tried to brush away the fallen grains, was quite inefficacious. I wished to go . 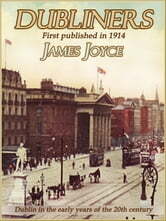 . .
Ulysses chronicles the passage through Dublin by its main character, Leopold Bloom, during an ordinary day, June 16, 1904.
is a novel by the Irish author James Joyce. It was first serialised in parts in the American journal The Little Review from March 1918 to December 1920, and then published in its entirety by Sylvia Beach in February 1922, in Paris. One of the most important works of Modernist literature, it has been called "a demonstration and summation of the entire movement". "Before Joyce, no writer of fiction had so foregrounded the process of thinking.­" Ulysses chronicles the passage of Leopold Bloom through Dublin during an ordinary day, 16 June 1904 (the day of Joyce's first date with his future wife, Nora Barnacle). Ulysses is the Latinised name of Odysseus, the hero of Homer's poem Odyssey, and the novel establishes a series of parallels between its characters and events and those of the poem (e.­g., the correspondence of Leopold Bloom to Odysseus, Molly Bloom to Penelope, and Stephen Dedalus to Telemachus). Joyce fans worldwide now celebrate 16 June as Bloomsday. Ulysses is approximately . . .
"Beyond PERFECT!­" Jimmy Cardy - Classic Tomb Book FEATURES: ? Ulysses - More than 20 illustrations are added ? Ulysess Introduction ? Ulysess Summary include episode structure ? Character Introduction ? Locations on Ulysess ? Ulysess Adaptations ? FREE audio book link at the end of the book ? FREE audio book link interview with Richard Kearney at the end of the book ? James Joyce's Biography plus photos ? James Joyce's Top Quotes ? Easy to navigated Active Table of Contents ? High formatting quality and standards, manually crafted by professionals Ulysses chronicles the passage of Leopold Bloom through Dublin during an ordinary day, 16 June 1904 (the day of Joyce's first date with his future wife, Nora Barnacle). The title alludes to Odysseus (Latinised into Ulysses), the hero of Homer's Odyssey, and establishes a series of parallels between characters and events in Homer's poem and Joyce's novel (e.­g., the correspondences between Leopold Bloom and Odysseus, Molly Bloom and . . .